The Shedd Aquarium has adopted a new animal to join its ranks—but he may not be the kind you’re thinking of. 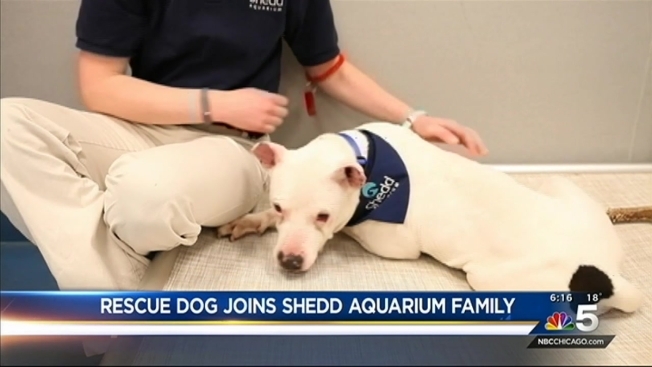 Three-year-old Kobe, a Dogo Argentino mix, is the fifth canine to be adopted as part of the Shedd’s rescue program, the aquarium said in welcoming the dog to the family. Kobe was found very thin and dirty with a rope tied around his collar, and rescuers suspected he may have been a junkyard dog, according to a statement from the Shedd. His previous owners had tried to crop his ears with a pair of scissors. He was on the euthanasia list at Kendall Animal Control in 2013 when Lucky Dog Rescue stepped in and moved him to a kennel. However, many adopters passed him up because he required too much exercise and mental stimulation. Kobe is the fifth dog to be adopted by the Shedd since 2013. He joins Dory, a female shepherd mix, and Marlin, a male Labrador mix. Two others, Bruce and Coral, have since been adopted to other homes. The aquarium’s trainers will work with Kobe and provide constant care for him, according to the statement. Later this year, he will join the “One World” aquatic show. For now, Kobe will mostly be behind the scenes, becoming acclimated to his new home and building relationships with the aquarium’s training team.